With a day of rest after finishing the chicken coop (or so we thought – wait til tomorrow’s post), it was back to ‘regular’ yard duties at the new house. That includes admiring the progressing fall colours and working on rotting my sod. 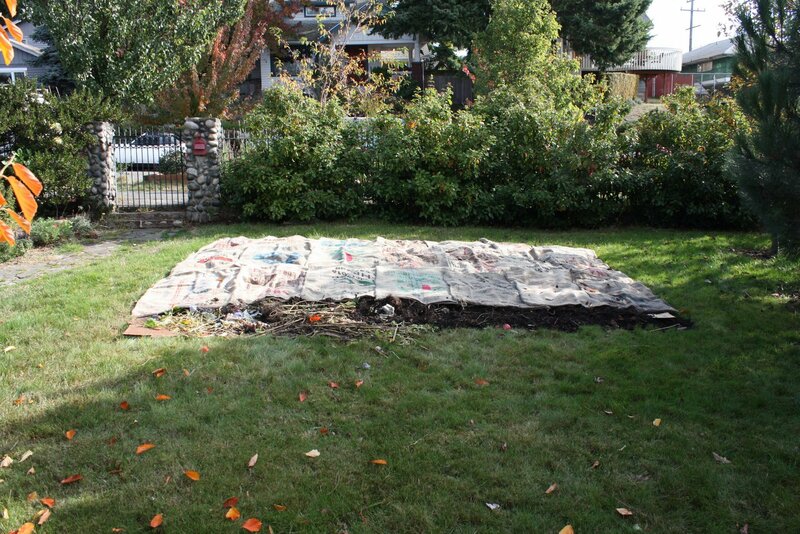 So far I’ve layed out a plot ~12’x12′. I wet the grass, laid down cardboard and covered them several inches deep with ‘junk’: chopped up greens and the dirt and decomposing matter in the compost pile I’ve inherited. On top of that I laid burlap bags from the local coffee house (Thank you C&P!). As fall progresses and the leaves fall I’ll add those under the burlap and hope the combined efforts result in compost by spring! 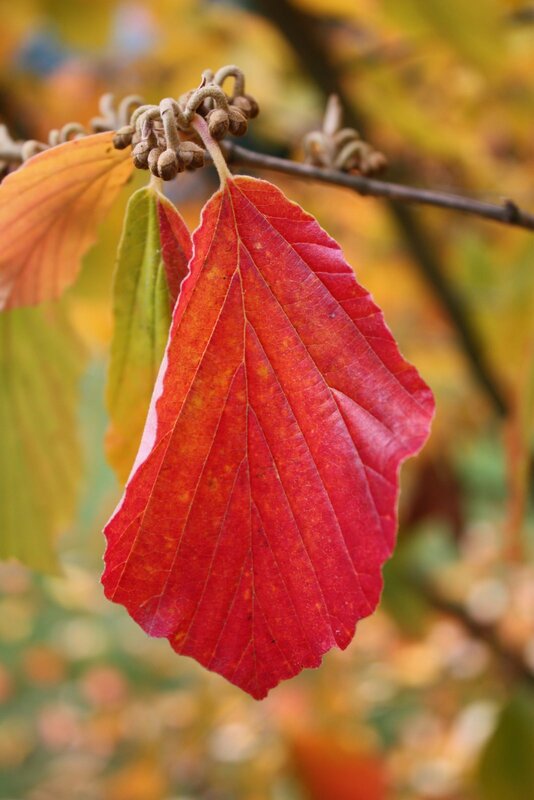 Meanwhile the nights get longer and colder, leaves continue to change, and to fall. See how the rotting sod turned out. This entry was posted in DIY, update, vegetable garden, witch hazel. Bookmark the permalink. 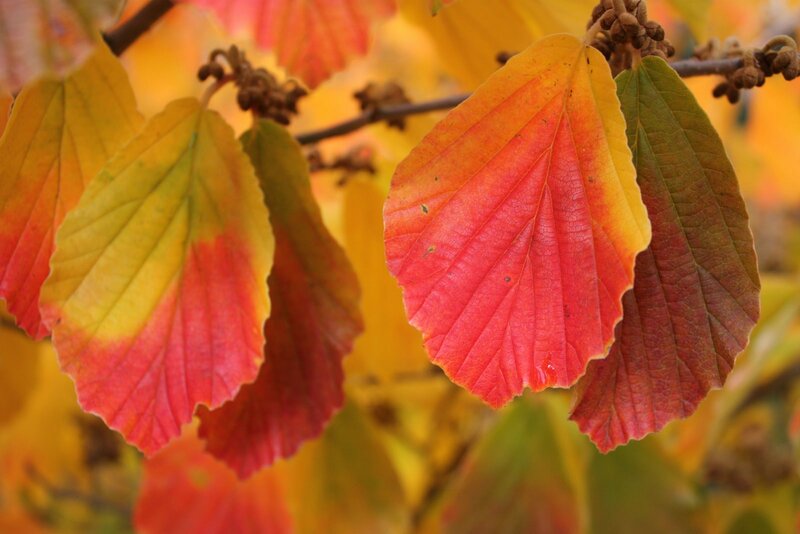 These are lovely fall leaves! Finally! I’m not even sure what in in our yard is deciduous yet, so it was a pleasure to see this witch hazel turn so pretty. The Japanese maple is starting to turn and will be lovely too I bet. Much of the yard is evergreen though, so I relish the fall colours when I see them. Yesterday I biked to UW and was stunned by the beauty of some of the trees I passed – mostly sugar maples. I want a sugar maple – and then I could tap it for syrup as well! !